When the Aerospace alumni interest group held its first networking event in September 2017, called Trajectories, organizers hoped to attract 40 or 50 people. Instead, more than 150 signed up. “We had to cut off registration and quit advertising the week before. The fire marshal wouldn’t allow any more people,” said Paul Anderson ’85, a Lockheed Martin engineer who helped start the interest group last year at the request of Mines President Paul C. Johnson. There seems to be a magnetic force drawing people to space science, at Mines and beyond, and the interest group is tapping into it. Student interest in the field has skyrocketed. The aerospace industry has become the third-largest employment sector for Mines graduates, with 10 to 15 percent of each class entering the field, said Angel Abbud-Madrid, faculty co-chair of the interest group and director of Mines’ Center for Space Resources. “We don’t even have an aerospace engineering department, but the skills our graduates have are very important to employers,” he said. Anderson, who currently works on NASA’s Orion project, developing spacecraft for astronauts to visit the moon and Mars, can attest to that. “Many disciplines of engineering are required to make the aerospace industry work. Only about 5 to 10 percent of aerospace professionals hold aerospace engineering degrees,” he said. In fact, most people enter the aerospace industry with a mechanical engineering background. “Think about putting together a satellite, figuring out the stresses and strains—that’s a mechanical engineer’s job,” Anderson said. Software, electrical and chemical engineers are also well represented in the industry. Mines graduates and its faculty have been involved in aerospace projects for over 30 years. In 1996, NASA selected the school to be one of 10 commercial space centers, drawing on Mines’ expertise with high-temperature phenomena and combustion. Since then, professors have conducted experiments at NASA facilities with an eye toward developing future products, Abbud-Madrid said. The school is also located in an industry hotbed. With companies like Lockheed Martin, Boeing, Harris Corporation, Ball Aerospace, Northrup Grumman, Raytheon Company and United Launch Alliance within its borders, Colorado is the nation’s number two state for aerospace jobs, Anderson said. The state also hosts the National Center for Atmospheric Research, the National Renewable Energy Laboratory and national research labs operated by the National Oceanic and Atmospheric Administration and the National Institute of Standards and Technology, all of which are involved in space research. “The breadth and depth of what Colorado does in aerospace is amazing, and all of that is supported by Mines grads. Demand will continue to grow for the skills and talents they have,” Anderson said. Despite its expertise and centralized location, Mines is not as well known in the aerospace community as it should be, said interest group member Tracy Copp ’99, MS ’01, a senior project engineer at Ball Aerospace. “Lots of alumni get into the industry, but they do it on their own. We want to make connections and show the community how compatible Mines is with aerospace,” she said. In addition to highlighting the school’s achievements, the interest group serves as a conduit for students. This is where the Trajectories event comes in. Students got to network with industry alumni at the event, which was co-hosted by the American Institute of Aeronautics and Astronautics. It featured speakers on topics ranging from NASA’s deep-space exploration program to the historic use of lunar cycle calendars. In October, the interest group also hosted a lecture by astronaut Al Worden, who recounted his experience as the command module pilot for Apollo 15. The group meets monthly and is planning a speaker panel for the spring. Soon aerospace employers may have even more reasons to notice Mines graduates. The school has proposed a new graduate program in space resources—the utilization of water, minerals and metals found in space, both for space exploration and for applications here on Earth. Though many people aren’t aware of it, outer space is full of materials that could be used for astronaut consumption or refueling spacecraft, said Abbud-Madrid, who last year gave a well-received TED Talk on the subject. “Think of an asteroid as a gas station with a convenience store attached to it. It has water for astronauts to drink and steam power to propel them to the moon,” he said. Extracting resources from space also makes economic sense—it costs $10,000 a pound to overcome gravity and launch a spacecraft into orbit. Space is also rich in metals and minerals that will eventually become depleted on Earth. Space mining is less far-fetched than you might think—according to some, it may be just a decade away. Already, companies like Elon Musk’s SpaceX, which launched 16 rockets in 2017, are working on ways to supply space settlements with water and minerals mined in situ. In September, NASA launched a spacecraft that will extract materials from a 2,000-foot-wide asteroid in 2018. Financial services firm Morgan Stanley predicts the space economy, already worth $350 billion, is expected to grow to $1.1 trillion by 2040. Future Mines graduates could play a major role in this grand experiment. Space resources brings together many fields where the school has a strong presence, including remote sensing, geomechanics, mining, materials, robotics, advanced manufacturing, electrochemistry, solar and nuclear energy and resource economics. Applying this knowledge to space research could give Mines students an important edge. “Knowing that students have been exposed to space projects could be of great value to employers in the future,” Abbud-Madrid said. The interest group needs more help to introduce students to the world of aerospace professionals and spread the word about Mines. 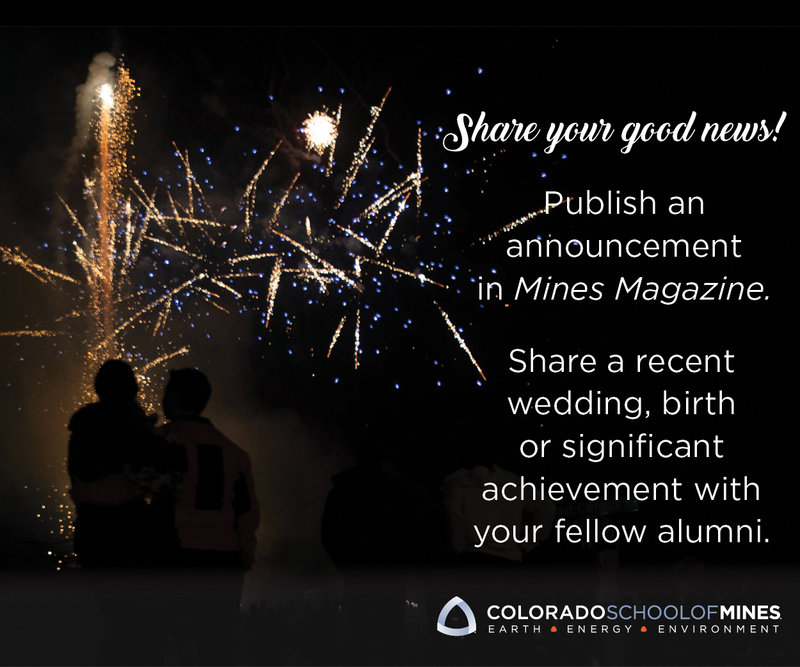 To get involved with the Aerospace interest group or to learn more about the other interest groups Mines has to offer, visit minesalumni.com/interestgroups.